A cool anime film with tons of creatures and different camps, stunning visuals, and a somewhat intricate plot. Hayao Miyazaki is undoubtedly the biggest name in the world of Japanese animation (Anime). His movies are always interesting, creative, and visually spectacular, but they don’t always make sense. Time and time again, I’ve found that they were cool movies to watch, but difficult to follow and understand. Movies like Spirited Away, howl’s moving castle, and even Ponyo involved characters that just turned into other characters, and we had to go along with it. And in all three of those movies, it was main characters too. So we spend half the movie watching the main character look one way and then the other half watching him look another way, with no explanation for the change. It’s probably the thing that frustrates me about his movies the most, and luckily Princess Mononoke has none of it. 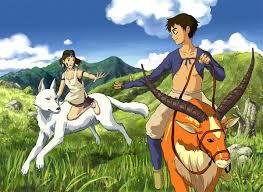 Perhaps that’s why I like Princess Mononoke the most, of any of Miyazaki’s films. It’s the movie that makes the most sense, and is very clear and understandable. It also has a plot that is less about cute magic and more about action, weapons, and beasts. And it’s not silly and immature, the way something like Castle In The Sky is. Instead, this movie involves bloody violence like arms and heads getting sliced off (basically, the things that work so well for anime movies, and yet that Miyazaki usually avoids.) here; he tries it, and comes away with a tremendous success. The storyline of Princess Mononoke involves a young man named Ashitaka (voiced to perfection by Billy Crudup), who is out his horse / deer friend one day when a giant monster attacks. The monster is a boar trapped by slimy purple squiggly ropes that surround him and move him about. They cover him so much that you can’t even see the boar underneath them, and Ashitaka sees the creature attacking people. He then takes his bow and arrow and attempts to defeat the creature himself, by shooting out its eyes. This works, but not before one of the purple squibs can latch onto Ashitaka’s arm, and cause him a severe burn. The burn turns into a dark purple mark that is spreading over his body. Ashitaka must find the cure for all this. In order to do so, he must travel to a distant land where it is said that the nature spirit, as well as many other animal gods live. Ashitaka is told of this forestland by Jigo (Billy Bob Thornton), a peddler who he meets along the way and who seems to know a lot more than he is saying. After the two of them sit down by a fire together one night, and Jigo points him in the right direction, Ashitaka is off to find this land. When he gets there, he finds a lot more than he bargained for. There are spirits and gods and great mythical creatures here to be sure, but there is also a war going on between humans and nature. There is a small mining colony of humans that welcomes Ashitaka in and embraces him as a local celebrity. This colony has a fierce woman as it’s leader, Lady Eboshi (voiced by Minnie Driver), and she has an agenda that Ashitake quickly learns about. She’s out to kill the wolf gods and the human who rides with them, princess Mononoke. There are ongoing battles between Lady Eboshi’s people and the wolves. At one point the people go hunting for them carrying large rifles out into the forest. At another, the wolves and the princess attack Eboshi’s fort and Princess Mononoke ends up breaking in. this is my favorite sequence of the movie, because the way that princess Mononoke moves is just stunning. She moves at rapid speed, running and jumping around and pulling knives and slicing through the air. The sound effects in this scene are brilliant, from the sounds of Mononoke’s footsteps as she runs up a roof, to the sounds of gleaming knives slicing through the air. Ashitaka sees Mononoke and lady Eboshi fighting and sees it as a chance for him to intervene. He knocks both of them out, representing neutrality as he refuses to take either side, and then leaves Eboshi to her people while he carries the princess off into the forest. As he is doing this, one of the men in Eboshi’s camp shoots Ashitaka through the chest, and yet he still manages to walk on, bloody, but unhurt. Clearly something powerful is at play here. As the movie goes on, Ashitaka and Mononoke become friends, but we learn that Lady Eboshi is not working alone with just her colony. She has also joined up with a band of hunters, led by Jigo (Billy Bob Thornton), and they wear boar skins over themselves as a disguise to get close to the boar they are out to kill. That’s when we learn that the boar are a clan here that is out to attack and kill the humans too, just like the wolves. And then there are also the gorillas who seem to be in fear about this war going on between humans and nature, and what it all means. The movie has all of these different clans and groups, and it is smart enough to not really have any of them join up (except for Lady Eboshi going over to the hunters). But the animal spirits each represent their own ideas, and so we get the hunters vs. the boars and the wolves vs. the colony and the boars vs. the colony. Each of these battles is magnificent. The visuals in this movie are really fantastic and exciting. And aside from the storyline and the action, this movie also embraces nature in a way that I have yet to see from Miyazaki’s films. The forest spirit is both a sort of reindeer with a human’s head, and also a giant, lizard-human like creature who walks around on two feet at night (I guess there had to be some transforming somewhere in this movie, after all, it is Miyazaki, but at least it’s not a main character doing the changing this time.) and then there are these cute little critters that look like white statues as they appear and disappear at free will, turn their heads to the side and then shake them with rattling sounds. It’s all pretty cool. 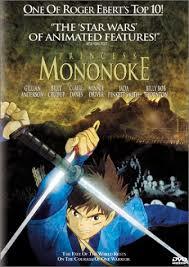 Princess Mononoke is a fun movie. It is said to be Miyazaki’s most serious and maybe even most personal film, and that’s probably because he is addressing adult themes here, as well as dealing with wars and violence and humans vs. nature, and gods and spirits. There is a lot going on in this film, and yet it is still the movie of Miyazaki’s that makes the most sense and is easiest to follow. With its stunning visuals and interesting storyline, this ends up being a very cool movie.